Company name: Adega Ponte da Boga S.L. 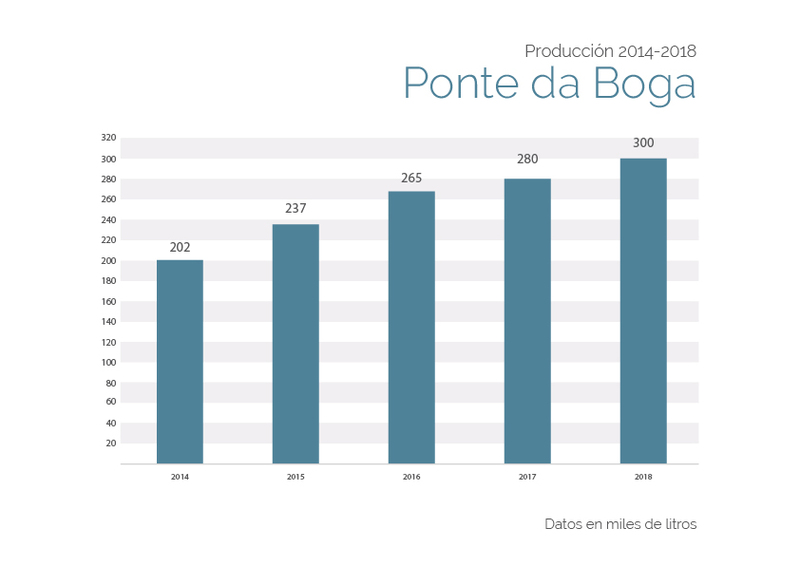 Ponte da Boga is a centenary winery situated in the municipality of Castro Caldelas, in the Ribeira Sacra of Ourense. Built in 1898 by a family from the area, the winery was extremely active until the 1960s when production ceased. It remained closed until 1999 when local vine growers decided to repair it and restart making wines in the traditional fashion, under the D.O Ribeira Sacra. In 2005 Ponte da Boga became part of the Corporacion Hijos de Rivera, within the area of Corporate Investment, which allows the winery to face new challenges such as improving its market position and to turn all its wines into references for quality and true reflection of the enormous grape-growing potential encased in the amazing terraced slopes which follow the course of the Miño and Sil rivers. Ponte da Boga produces Ponte da Boga Mencia, Ponte da Boga Blanco de Blancos, Capricho de Merenzao, Alais and Bancales Olvidados. In addition to these, there is a limited edition collection of wines: Ponte da Boga Expression Historica. The heart of Ponte da Boga. It is obtained thanks to the brilliant work of its vine growers on the slopes of the Sil, Miño and Bibei rivers, where the delicate Mencia variety is cultivated on different soils composed of schist and slate, accompanied by rainy springs and mild, dry summers, to produce a wine with a wonderful aromatic personality, full of red fruit notes, violets and a light hint of spice which, in addition to its density, lightness, and brightness, will accompany us on every occasion we enjoy a glass of this serious, elegant and decidedly delicious wine from the Ribeira Sacra. The Ponte da Boga Godello originates from the traditional combination of the varieties that enrich the Ribeira Sacra; the balance and refreshing acidity of the Godello, the aromatic spark and the spirit of the Albariño, the seriousness of the Dona Blanca or the intense fragrance of the Loureira, make up this complex white wine, in which the light citrus, apple and rose notes go hand in hand with the pleasant acidity and persistence which invite us to continue enjoying the delightful and personal sensations of the scarce and fantastic vines that grow on the slopes of the Ribeira Sacra. An overwhelming personality, a result of our Alaïs plot, the extremely scarce and ancient Merenzao variety avoided total extinction thanks to the work of a group of passionate vine growers who learnt how to cultivate it, and decided to do so with the exceptional attention, effort and care needed. It is a task we continue to carry out in Ponte da Boga in order to be able to produce this passionate wine, full of fruit and flowers, delicate and powerful, and an expression of the potential and diversity that fills a unique cultivation area, the Ribeira Sacra. This wine pays tribute to our vine growers, always excellent and at times exceptional, who continue to cultivate some remote plots of centuries old vines, of an incredible potential and singular beauty, used to make this wine. Bancales Olvidados is an assembly of Mencia cultivated in Manzaneda, Amandi and Quiroga, full of personality, floral and elegant, with a delicious balance bestowing freshness and structure in equal measure. It evokes the immense vine growing potential of the most beautiful and isolated locations in the Ribeira Sacra. On the occasion of the 800th anniversary of the Cathedral of Santiago of Compostela in 2011, the company decided to produce a limited edition wine as a tribute to this important date which would go alongside the rebuilding work of the Cathedral, programmed to last four years, and the different architectural styles which influenced the Compostela’s temple. This decision gave way to a series of limited editions, Ponte da Boga Expresión Histórica, Expresión Románica, Expresión Gótica and Expresión Barroca. Four collections of which 800 cases are produced annually in 3-bottle, 6-bottle and magnum formats. The wine is a delicate assembly of the Ponte da Boga red varieties, in which the Mencia rises as the Master of Ceremonies, accompanied by the Merenzano, Souson and Brancellao. 20% of the wine is kept in barrel with 10-month crianza wine, and the rest in a steel tank, creating a fresh, palatable, elegant and serious wine. Ponte da Boga Expresion Gótica is the second edition of the wines that commemorate the bond between the Company and the restoration work on the Cathedral of Santiago de Compostela on its 800th anniversary. This limited series of wines, launched at the end of 2012, is the first to reflect the artistic stages which make up the Cathedral of Santiago (Romanesque, Gothic and Baroque). Ponte da Boga Expresion Romanica is the third edition of the wines that commemorate the bond between the Company and the restoration work on the Cathedral of Santiago de Compostela on its 800th anniversary. This limited series of wines, launched at the end of 2012, is the first to reflect the artistic stages which make up the Cathedral of Santiago (Romanesque, Gothic and Baroque).